DM Metalloys Pvt. 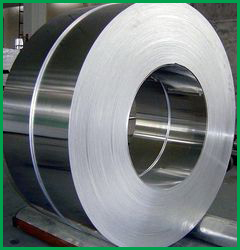 Ltd. is an eminent supplier, manufacturer and exporter of stainless BA finish of grades such as 304/304l/316/316l coils. The definitive use of a BA finish is domestic such as the interior of a dishwasher or clothes washing machine. In the garments washer, it also provides a smooth, non-abrasive surface for the clothes to slide everywhere. The mirror like surface is also used in road mirrors where a precise image is not obligatory When specifying this finish think about these attributes the BA is common in some grades and thicknesses, but not all, It is also highly corrosion resistant because it is very smooth, It is has been produced in the mill and can't be exactly harmonized after fabrication although a mechanical mirror polish can be close. DM Metalloys Pvt. Ltd. Supplies Stainless Steel 304/304L/316/316L BA Finish Coils in Faridabad, Gurgaon, Gurugram, Gaziabad, Noida, Lukhnow, Delhi, Delhi NCR, Ludhiana, Amritsar, Chandigarh, Jalandhar, Baddi, Punjab, Uttar Pradesh, Haryana, Mumbai, Pune, Sahibabad, Meerut, Manesar, Bhiwadi, Bawal, Neemrana, SIDCUL, Sonepat, Ambala, Mohali, Panchkula, Kapurthala, Bareli, Kanpur.